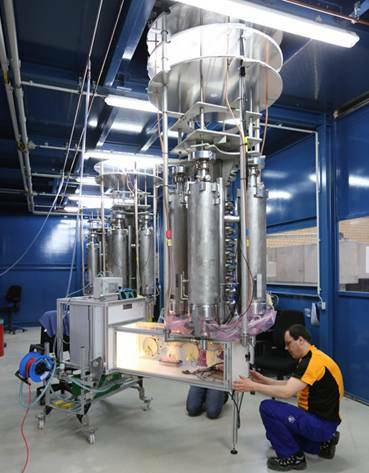 The characterization of superconducting cavities usually happens in so-called vertical test stands. The cavities are attached to the insert of a large dewar. The cavity vacuum system is pumped, the cavity cooled down to typ. 2 Kelvin. At DESY the inserts are adaptive for different cavity types, and usually have an adjustable RF antenna. Typical measurements start with the accelerating gradient as a function of the loaded quality factor (eq. to cryogenic losses). More sophisticated are RF measurements in the different pass-band modes, the temperature map or a second-sound measurement to locate quenches. Sensors checking radiation caused by field emission and magnetic flux complete the picture. The standard DESY insert takes four cavities which are cooled down together. The testing at 2K is done four the individual cavities. The right picture shows a single cell 1.3 GHz cavities tested as part of the ongoing R&D program.